Ogawa Gesshu 小川 月舟 1891 - 1967 Born in Onomichi, Hiroshima Prefecture, Ogawa aspired to become a painter and attended Tokyo University of Fine Arts (Tokyo Geidai), a prestigious art school to this day. Developing an interest in photography, Ogawa dropped out of school to pursue photography at a time when pictorialism was flourishing in Japan during the Taisho Era (1912 - 1926). Throughout the 1920s he produced many artistic images in both silver gelatin and bromoil, a pigment printing process that Ogawa came to master. One of his most important works from this period was a view of Doro Gorge in Japan, an iconic view printed in bromoil highly representative of Japanese pictorialism crossing over to modernism. He was also published in leading photography journals of the day including Hakuyo, a collotype printed monthly published by Hakuyo Fuchigami from 1922 to 1926. In 1927 Ogawa opened a portrait studio in Osaka applying his artistic esthetic to commercial photography, gaining him further notoriety in both commercial and artistic circles. Throughout the 1930s Ogawa continued to operate his portrait studio and in 1948 when the Kansai Photographers Association (Kansai Shashin-ka Rengo-kai) was established, Ogawa was appointed Chairman of the group. When he died in 1967 he left behind a body of work that is considered some of the finest art photography done in Japan during the twentieth century. His work is now held in the permanent collections of many museums including the Tokyo Metropolitan Museum of Photography and the Yokohama Museum of Art, as well as his work being included in a major touring exhibition on the history of Japanese photography from the Museum of Fine Arts, Houston. All photographs come directly from Ogawa’s estate and include estate certificates in Japanese, signed and authenticated by Ogawa’s nephew. Kurokawa Suizan 黒川 翠山 1882–1944 Often considered the father of Japanese pictorialism photography, Kurokawa was born in Kyoto with his birth name being Tanejiro Kurokawa. The son of a Kyoto textile merchant, he worked in his family's business until the age of thirteen. In 1900, due to heavily incurred debts, the family firm went bankrupt. This event had great impact on Kurokawa and as a result he began to pursue photography. In 1906 he entered a photo competition at the Sensho Kinen Hakurankai Exposition, held to commemorate Japan's victory in the Russo-Japan War. His work entitled Ame Ato (After the Rain) showed a view of Mount Hie which garnered him a silver award. This became the spark that launched his career. Kurokawa was regularly published in the Osaka based magazine Shashin Reidai-shu (lit. Photo Example magazine) around 1910. He was also employed in the photo department of the Hakubun-kan publishing company's Kyoto office. His photographs were also published in photography journals, as well as kabuki magazines during the 1910s and 1920s. He is best known for ethereal views of landscapes and cultural landmarks, portrayed in a style heavily influenced by sansui-ga. This traditional style of Japanese painting interpreted through photography became Kurokawa's trademark. 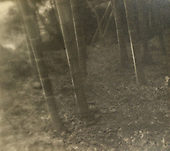 As a result, his concepts had a strong influence on many Japanese pictorialist during the peak years of 1910 to 1925. A major holding of Kurokawa's work is kept in the permanent collection of the Tokyo Metropolitan Museum of Photography. Hirogane (1894 - unknown) was a talented pictorialist who financed his passion for photography through his professional life. Such avocation scenarios were commonplace with Japanese art photographers during the 1920s and 1930s. A corporate accountant by profession, Hirogane was born in Okayama City, the first son of Tamataro Hirogane. In 1916 he graduated from Tokyo Shogyo Koto Gakko (Tokyo Commercial School, now known as Hitotsubashi University) and upon graduating was employed by Mitsubishi Heavy Industries at their Nagoya Aircraft Manufacturing Division as a section chief accountant. Hirogane is known to have resided in Nagoya as late as 1938, but it's not known exactly how long he remained there. But he was fortunate to have been living in Nagoya which had a thriving photo art scene during the 1920s and 1930s. This was mostly centered around the Aiyu Shashin Club (Aiyu Photo Club) which was founded by Japanese photo greats Chotaro Hidaka and Matsutaro Ohashi. This group was dedicated to romantic landscape pictorialism, often times employing the use of pigment printing. It is possible, but only speculation that Hirogane was in contact with this group. During his most active period of the 1920s, Hirogane mostly produced works in silver gelatin and bromoil prints depicting rural scenes and industrial views. It is now presumed the majority of these images were taken in and around Aichi Prefecture where Nagoya is located. Okuda was a pictorialist based out of the Nara, the ancient capital of Japan. During the 1920s he studied under Suizan Kurokawa, the father of Japanese pictorialism. Being heavily influenced by his mentor's ethereal style of photography, Okuda developed his own style which bridged the pictorialism and the modernism photography genre. All of these prints come from an archive of photographs by Okuda discovered in Tokyo in the mid 1990s. Many of the prints bore Okuda’s Japanese kanji red hanko stamp on the reverse, as well as matching many negatives included in the archive. Due to the type of gelatin silver paper they are printed on, the prints were dated from the 1920s to the early 1930s.